Released in 2000, The Emperor’s New Groove was one of the earliest “post-Renaissance” Disney animated films. The film originated as an entirely different, more traditional Disney musical before being reworked into a buddy comedy, leading to a highly turbulent production. But the change ultimately paid off, as The Emperor’s New Groove was one of the best Disney movies of its time, and its emphasis on comedy makes it one of the more unique Disney features. The Emperor’s New Groove tells the story of Kuzco (David Spade), a Mesoamerican emperor who’s young and spoiled. Kuzco lives a pampered lifestyle, and has become so selfish that he can’t seem to think of anything other then himself. In one of his routine acts of selfishness, Kuzco plans on having a small peasant village destroyed, to make room for a Summer getaway as a birthday gift to himself. Kuzco’s life gets turned upside down, however, when he fires his longtime advisor Yzma (Eartha Kitt). Yzma, seeking revenge for being fired, plots to kill Kuzco and take over the throne. But her dimwitted manservant Kronk (Patrick Warburton) botches the murder. 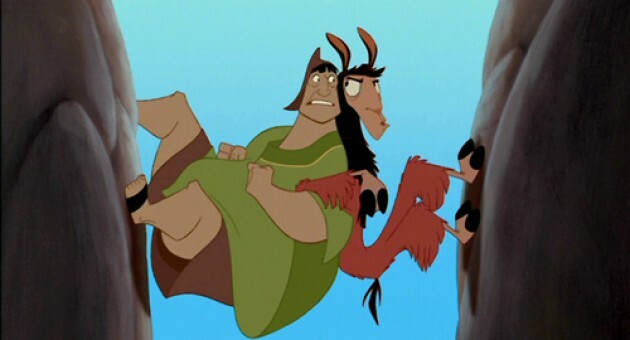 Instead of poisoning Kuzco as planned, Kronk accidentally slips the emperor a potion that transforms him into a llama. 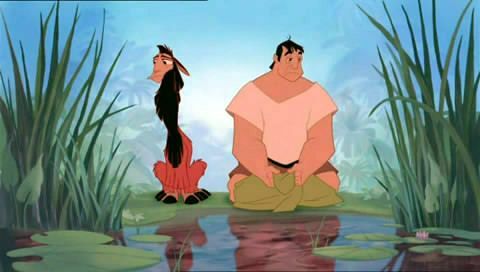 Kronk can’t bring himself to finish the job, and through a series of mishaps, Kuzco ends up in the very village he plans on having bulldozed, where the peasant Pacha (John Goodman) and his family live. Kuzco and Pacha form a reluctant partnership to get back to the palace and change Kuzco back to a human, with Pacha hoping his help will change the emperor’s mind about destroying the village. It’s a very simple story, but The Emperor’s New Groove isn’t aiming to be one of Disney’s grandest features. 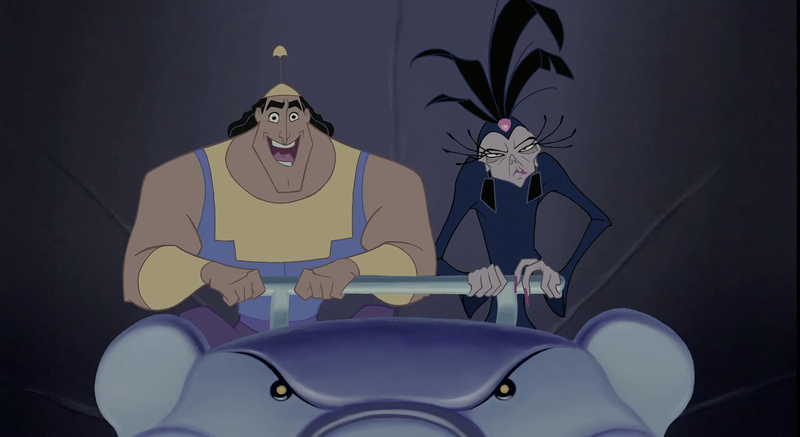 The Emperor’s New Groove is all about the laughs, and in this regard it’s a wild success. The Emperor’s New Groove is, in a lot of ways, more cartoon than an animated movie. In this case, that’s not such a bad thing. It uses slapstick and fourth wall-breaking liberally, and features some genuinely hilarious dialogue. Best of all, its four main characters are wonderfully entertaining personalities. Kuzco starts off downright unlikable, but the sheer magnitude of his ego makes for some entertaining banter with the good-natured Pacha. Even when Kuzco inevitably starts to ease up, his sarcasm keeps his comedy intact. Pacha is interesting because, if this worked like any other Disney movie, he’d probably be the main character, but here he’s humorously relegated to the buddy role (at one point, the movie even pauses to make a joke about it). Yzma is one of Disney’s best comedic villains, with Eartha Kitt’s vocals giving the character boisterous energy and charisma. It’s Kronk, however, who steals the show. Kronk could have easily been another throwaway villainous henchman. Instead he’s made more unique for being kind-hearted and often well-intentioned, he just happens to be working for the antagonist. He’s also a lot more capable and knowledgable than his bumbling exterior suggests. The film has fun, simplistic animation. It’s not the most ambitiously animated Disney feature, but it’s colorful and fun enough to perfectly compliment the film’s cartoony nature. If the film has one notable drawback, it’s that its third act is surprisingly lacking in substance. Yes, The Emperor’s New Groove is more cartoony than most Disney movies, so one shouldn’t expect a grand finale. But the film’s final moments feel rushed and incomplete, a possible side effect of the movie’s countless production and scheduling problems. The rest of the movie is briskly paced, but the last act, while still funny, feels like it’s speeding through the remainder of its running time. It’s a shame, because with just another ten or so minutes to give the film a proper ending, The Emperor’s New Groove might have been one of the Disney greats, instead of “merely” being a really, really good Disney movie. In the end, The Emperor’s New Groove is far from the biggest film Disney has ever made, but it isn’t exactly trying to be. It’s content with simply introducing a quartet of fresh, funny characters, giving them some witty dialogue, and setting it all free with nonsensical, cartoonish antics. It’s an undeniable good time.